Doing a little bit of something every day can make a huge difference overall. This is the same when it comes to cleaning and getting organised around the home. In fact, having routines can simplify our whole life. That’s where a cleaning schedule can be a marvellous thing! A cleaning schedule can be set up to suit you and your life style, as a great way to simplify your life. Whether you want to do a whole lot every day or the bulk of your tasks on only some days of the week, there is a lot of flexibility in setting up your own personalised cleaning schedule. But the key theme is making light of the work by knowing exactly what you want to be doing and when. Cleaning isn’t fun. There aren’t many people that enjoy it. (Well there could be a few… and if so, you’re welcome to come clean my house too *wink wink*). But it’s something that needs to be done otherwise you end up living in total and utter chaos. The worst part of that is then when you do decide enough is enough and you need to get to it, suddenly it’s a massive job that takes up a whole day or weekend when it should have been less than an hour of your day gone every day. 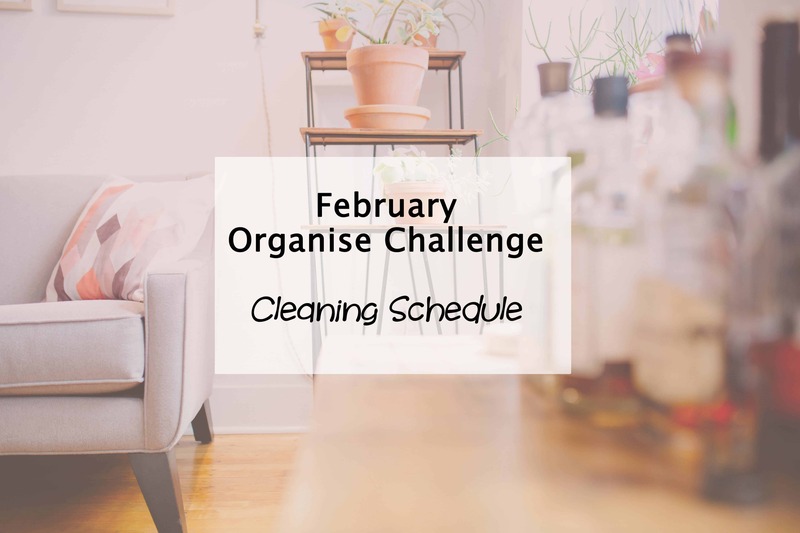 So this month’s organise task is to create a cleaning schedule (and stick to it). I have taken a chunk of the hard work out for you by creating a cleaning schedule template for you to download and print. You’re welcome! All you need to do is fill in the tasks you want to do every day as well as the less frequent tasks for monthly, quarterly and yearly cleaning. Pretty simple stuff. And far more fun than the actual cleaning part. Remember this is your cleaning schedule so make it realistic and achievable. Work it around your personal schedule and family routine. And if you end up super busy elsewhere… like actually going out and having fun on the weekend, and you skip your scheduled tasks for the day… BIG DEAL! You can catch up another day… or even next week if you need to. It’s your schedule, your way! Don’t forget you can find all the SIMPLIFY MY LIFE challenge tasks so far right here as well as find out exactly what it’s all about if you missed the start. It’s easy to catch up and join in any time you like, with as many or as few tasks as you like. Be sure to pop back Tuesday for this month’s Simplify task too. It ties in well with last month’s simplify task with identifying where our time goes. Do you have a cleaning routine in place already? What is your most hated cleaning task? I am a real stickler for routine. I have set days for particular loads of washing and set days for chores. I find this just really helps with fitting everything else into my day. That sounds like a great system. Routine is a wonderful thing! Dropping by from TTT! Thanks for sharing! I have always believed that it was so much easier to clean all at once, but since having kids, that has become impossible. Love the idea of having a schedule! I think I’m going to have to try that! Thanks for sharing! I am trying to have a cleaning schedule to make sure I tackle the jobs I hate the most – cleaning the bathroom being top of my list! Wow! I need to make a cleaning schedule! It’s hard to keep up with a new baby, 2 dogs, 2 cats, the business and the house! Smaller chunks each day are so much easier to achieve (and don’t use up a whole day worth of blogging haha). It is much easier to maintain the house if cleaning a bit at a time. If I try to clean the house one day a week it is an all weekend event. No one likes that so I try to pick up and clean in small increments. That’s how we were spending weekends too. No fun at all! I was a full time working mom outside the house and helped hubby in his business. The only way I managed for 30 years was to pay someone to clean. We knew it was surface clean so periodically we would take a room apart and give it a thorough overhaull. Now my goal is to declutter paper. I wish I could afford a cleaner right now lol there are some jobs I just hate doing! I guess I’m fortunate to have a lady who does help me do the hard cleaning tasks. I love sweeping and organizing, when I’m in the mood, so for me, I don’t see cleaning as something I shy away from. My daughter lives with me with her three amazing animals and that requires more vacuuming and cleaning to keep things fresh. I think there are times of the year (fall and spring) when people get more into the cleaning mode, especially the fall for me. I am one of those that does not like to clean… I do like the idea of the cleaning schedule and I think that might help me stay on track as far as keeping things tidy! Thanks for sharing! I just need to get organized LOL then I can clean, but this is very handy tool, thank you! Holly thanks for linking up with me on #wednesdayswisdom. Your post will feature this coming week, so well done. I cannot wait to see what you bring us next time. Spell check? Great articles. Organize or organise? Sharon, I’m in Australia therefore spelling is different for many words. English (UK) not US. Thanks for letting me know Alyssa. I only added that pop up just over a week ago so feedback is appreciated. It’s definitely helpful to have a cleaning schedule. When I keep it, I see that I accomplish more and feel better overall. When I don’t, I feel bad to have been behind. I like your advice not to be too hard on ourselves and keep it flexible. Thanks, Holly! A cleaning schedule really does help! Thanks so much for linking up at Totally Terrific Tuesday! I hope you come link up again this week. The party starts at 10pm Monday night! Great tips! I’m excited to use some of them around my house! Thanks for sharing at the #HomeMattersParty – We hope to see you again next week. Stopping by from #WednesdayWIsdom. I love your cleaning schedule, thank you for sharing, but I think nothing will make me love cleaning. The only way to get my house spotless is to make me mad, then I go on a huge cleaning spree. I think with five kids I’ve got used to the clutter and I’ve let me standards slip a bit. I love cleaning schedules! They make the work so much easier and the efficiency much higher! The challenge sounds great to me! Thanks for the post! Greets, Lewisham Carpet Cleaners Ltd.